Today I was doing more of what I love most…. my original paintings in miniature on silk. This time I made the artworks (and some which I had painted previously) into brooches. All except one are watercolour technique. The odd one out incorporates gutta outline. Some of these were painted to match some of my silk scarves to be offered for sale as a set. The brooch, by itself, retails at $20 AUD (post free) so if you would like one, please let me know. If the one you want is sold, sorry, you miss out. That is because for watercolour technique on silk, the way I work, it is not possible to repeat the painting. Each is a unique, handpainted, original artwork. 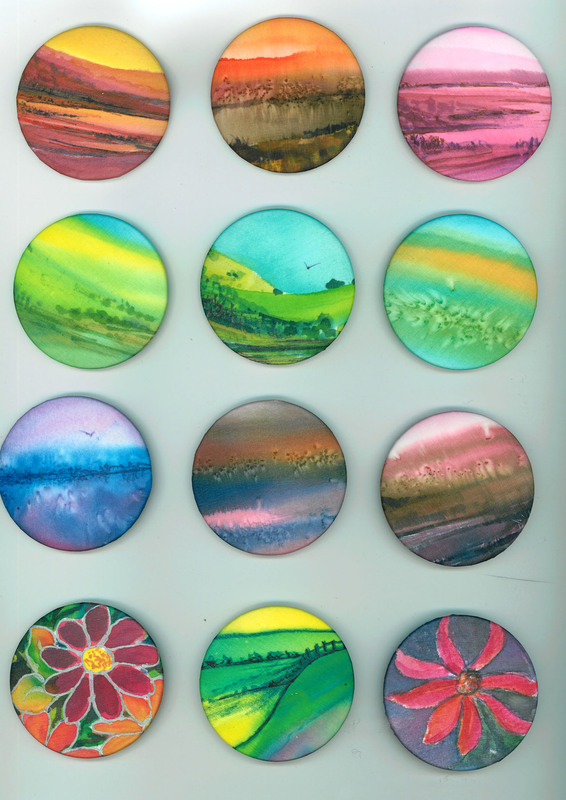 They are 60mm in diameter and treated with a UV and stain resistant finish for silk. This entry was posted in art, miniature art, painting, Silk painting, Tasmanian artists, Tasmanian landscape, watercolour, Wearable art and tagged colour, handcrafted, handmade, handpainted jewellery, made in Tasmania, Miniature art, original paintings, silk painting, Tasmanian art, watercolour on silk, wearable art, [painted landscape. Beautfiul art! Love your use of color!